The number of commercial growers is gradually increasing as they are getting lucrative price of their produce both in local and outside markets. In Rajshahi markets, the high valued fruit is being sold at Taka 550 to 600 per kilogram while in posh markets of capital Dhaka it is being sold at Taka 700 to 800. But, the price is beyond purchasing capacity of the commoners. More than 125 demonstration plots of the cash crop were established in Rajshahi, Natore, Pabna and Bogra districts and the national figure is more than 1050. Integrated Quality Horticulture Development Project (IQHDP) of the Department of Agriculture Extension (DAE) is imparting necessary training to the farmers on how they make their dragon farming more profitable and sustainable. SM Quamruzzaman, project director of IQHDP, told BSS that there are tremendous prospects of growing dragon fruit in different districts of the country as its topography and environment is suitable for the farming. 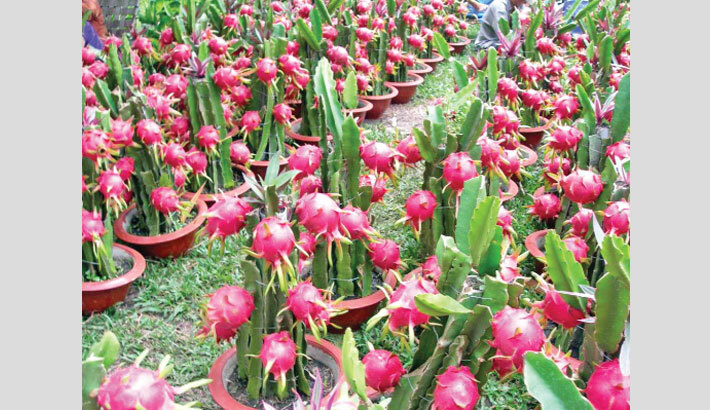 He informed that 43 horticulture centres in 35 districts are extending technical know-how to the farmers and supervising the demonstration plots regularly as the cultivation of dragon fruit is easier than many other crops. “We have some foreign fruits successfully produced in Bangladesh. Dragon fruit is one of them,” said Quamruzzaman. Very recently it was imported to Bangladesh by Germplasm Centre of Bangladesh Agricultural University in Mymensingh and profitably cultivated in some districts. The plant is nothing but an evergreen cactus, which reaches up to 1.5 to 2.5 meters high with leafless thin vine-like branches. It needs support to hold the vine upward. It reproduces from seeds and from branches (cuttings). But preferable to grow from branches because growth of dragon plant from seed germination is found to be comparatively slower. Compost in loamy soil is favourable for growing. Over-watering should be avoided as it may cause fruit-splitting, flower-dropping, yellowing of the plants, and slow shoot development. Regular mulching around the plants is also important along with providing dynamic lifter and dolomite every alternate month (100 g per plant). The plant blooms only at night, which can affect the process of pollination. In such a case, its growth may be encouraged with the hand pollination technique. Narrating its salient features Quamruzzaman said dragon fruit is suitable for everyone to eat. Flesh and seeds are edible parts and they are eaten altogether. It supplies fiber which is digestive and helpful for healthy liver. The rest portion of the fruit includes carbohydrate and water. A fresh fruit keeps a person fresh and well fit for a long time. Dragon fruit is also used in beverage, making juice and wine and as a flavoring agent in various foods and drinks. It contains a lot of vitamin C, minerals and other nutrients. Dragon fruit contains more than 3 times the amount of vitamin C found in carrots. The fruit has a leathery and leafy skin with a flesh that is creamy textured and studded with lots of tiny, black and crunchy seeds throughout. It is mildly sweet tasting and especially low in calories. The seeds are digested only if chewed. The flavonoids in dragon fruit lower the risk of heart disease and high blood pressure. It also reduces oxidative stress and artery stiffness as found in animal studies and therefore is thought to prevent complications associated with diabetes. The high antioxidant levels lower the risk of many types of cancer.